Home SPORTS Struggling Thika United slow down K’Ogalo’s title ambitions at Thika. 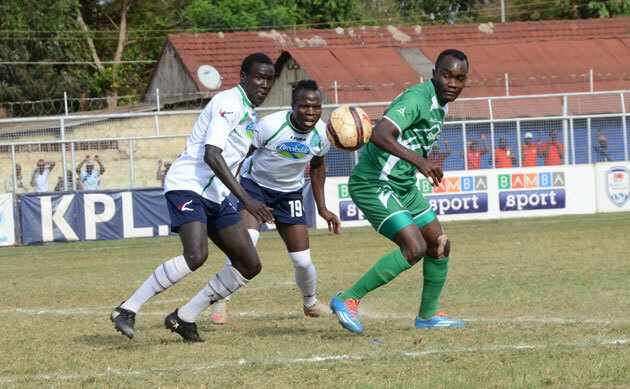 Struggling Thika United slow down K’Ogalo’s title ambitions at Thika. Thika United’s Christopher Oruchum closely guards Gor Mahia forward Timothy Otieno during a Kenyan Premier League clash at the Thika Stadium yesterday. A hard fighting Thika United Thika United resurrected their hopes of remaining in the top tier next season after holding Kenyan Premier League leaders Gor Mahia to a barren draw at Thika Sub-County Stadium on Sunday evening. This was the first time K'Ogalo have failed to score under coach Dylan Kerr but was enough for the fifteen times champions to maintain their 9-point advantage at the top of the log. The result moved K'Ogalo to 52 points, nine ahead of second placed Sofapaka who drew 0-0 with Kariobangi Sharks on Saturday and with a match at hand. Most would have expected Gor who have scored seven goals in two matches to come in and exert their dominance over the relegation threatened Thika United, but the home side came in full throttle, showing that they can also contest by taking K’Ogalo head on. “I am disappointed for the fans. I want to see more from Karin Nizigiyimana, I want to see more from Walusimbi and Meddie Kagere. They are international players. I am not thinking about the title. Right now it's about winning games and getting to know the formation that works best for the team,” said Gor coach Dylan Kerr. Gor had the first chance of the game with Kagere getting an opportunity at close range from a Timothy Otieno cross, but the ball took an awkward bounce infront of him bumping on his knee and chest before going wide. K’Ogalo continued to put in the early pressure with Nizigiyimana’s shot from the edge of the area blocked for a corner by the resilient Thika defense. Thika United had adopted a cautious approach to the game, starting with six defensive players as a measure to protect themselves from the massive threat posed by their visitors. 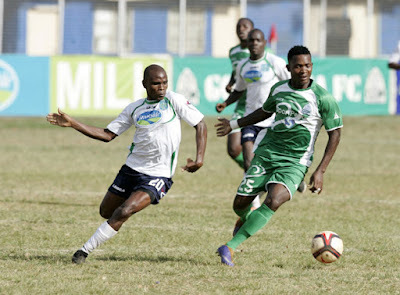 Gor Mahia George ‘Blackberry’ Odhiambo against Thika United’s Francis Muturi. Thika were cool, calm and composed in their approach and they passed the ball beautifully with Saad Musa and Said Tsuma combining well in midfield, Eugene Mukangala and Shami Kibwana providing the options upfront. The hosts thought they had grabbed the lead in the 25th minute when Kibwana tapped away from Boniface Oluoch from way out after a swift counter attack from a corner, but the first assistant referee’s flag was up for offside. After the restart, Gor threw bodies upfront and a foul from 30 yards out saw Kenneth Muguna get a chance from a free kick but the set piece flew straight into Thika keeper Allan Owiny’s arms. Nicholas Muyoti’s men continued knocking the ball beautifully around the field, trying to open up the Gor defense. They succeeded in the 28th minute when Saad released Mukangala who was isolated on the right, but the latter’s attempt at beating Boniface Oluoch at his near post was weak. The game turned out into a full contest especially in the centre of the pack where they two sides sought dominance. It was a beautiful display from the two sides and no one at first sight would judge Thika as a side fighting relegation. At the stroke of halftime, Gor had the ball inside the net when Meddie Kagere connected to a Timothy Otieno cross but the goal was ruled out for offside. 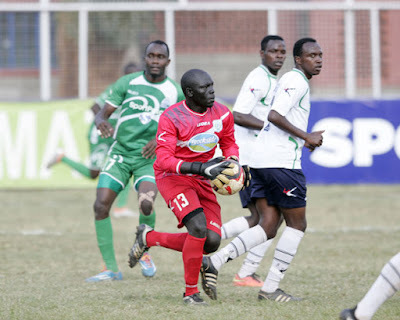 Thika United goalkeeper Allan Owiny in action against Gor Mahia. In the second half, Gor dropped down their levels, fatigue clearly stepping on their toes having played three games in a week all on travels. Timothy Otieno had Gor’s first and best chance of the second half but his shot from the edge of the box after being teed up by Muguna with a clever little back heel went wide. On the counter in the 58th minute, Thika should have gone into the lead but Kibwana with only Musa Mohammed to beat took too many touches on the ball, allowing the backtracking Gor players to come in for cover. Gor Mahia boss Dylan Kerr made changes, pulling out Ernest Wendo for Oliver Maloba while Otieno came off for Jacques Tuyisenge. With the change, Gor went up with two strikers, Tuyisenge teaming up with Kagere while Maloba went wide. Kenneth Muguna who had been deployed as a number 10 dropped back to the creative midfield slot while Philemon Otieno took over the role of defensive midfielder. Later, Francis Kahata was introduced for George Odhiambo as Kerr sought keys to unlock the Thika defense. Again, it was the hosts who had another chance of breaking the deadlock, again Mwinyi finding himself in space after intercepting Boniface Oluoch’s low clearance but he could not get a shot on target. In the final 10 minutes of the game, Gor piled pressure in search of the winner with Tuyisenge seeing two of his close range efforts well saved by Thika keeper Owiny. Thika United Starting XI: Allan Owiny, Musa Asad, Benson Iregi, Dennis Odhiambo, Christopher Orumchun, Suleiman Ngotho, Wilson Anekeya, Eugene Mukangula, Samuel Mwanje, Shami Kibwana, Said Tsuma. Subs: Eliud Emase, Michael Mutinda, Francis Muturi, Dennis Lewa, Stephen Odhiambo, Dennis Matasi, James Kinyanjui. Gor Mahia Starting XI: 29. Boniface Oluoch, 14. Karim Niziyimana, 5. Musa Mohammed, 18. Haron Shakava, 20. Ernest Wendo, Godfrey Walusimbi, 10. Kenneth Muguna, 30. Philemon Otieno, 22. Meddie Kagere, 25. George Odhiambo, 17. Timothy Otieno. Subs: 16. Shaban Odhoji, 4.Wellington Ochieng, 8. Francis Kahata, 7. Jean Baptiste, 28. Oliver Maloba, 21. John Ndirangu, 9. Jacques Tuyisenge.